Acoustic enclosure for a Test Rig & Pressure Test Process at the Aircraft Engine Overhaul, Service & Maintenance Division of a major UK based aviation company. To design, manufacture, deliver, install and commission the required enclosure, these being of approximate overall sizes 5.3m long x 3.2m wide x 2.5m high. 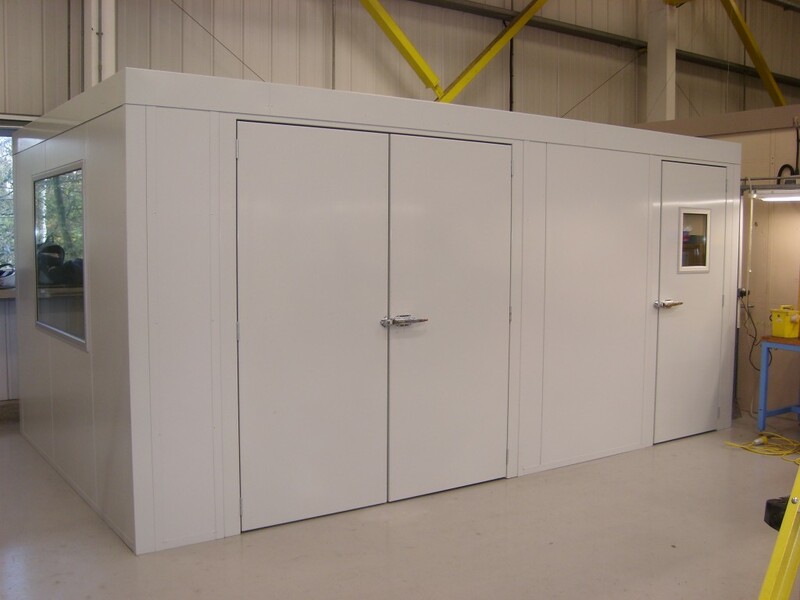 The enclosure is to be divided into two separate work area’s via an internal partition wall, the work area’s being a room to accommodate the Oil Test Rig and Chiller, and a second room for carrying out the necessary equipment pressure checks. Both work area’s are to be fit for purpose in providing a safe working environment for operational personnel. The enclosure is to incorporate a single man access door to the Bench Test Rig / Chiller room, and a double set of man access doors to the Pressure Test Room, each with flush thresholds to avoid trip hazards and to facilitate the installation and/or removal of test equipment on wheeled trolleys. To provide operational personnel with a view of the Pressure Test process from the Test Rig / Chiller room, a vision panel is to to be incorporated into the internal partition wall. A second vision panel is to be incorporated into the end wall of the Pressure Test room so that personnel can view both work area’s from the outside the enclosure. The internal partition wall is to accommodate a number of suitably sealed gland plates for ‘room-to-room’ connection of hydraulic hoses, pipework, electrical cables and control wiring etc. To provide small power & lighting and data communication facility within each room. Based upon a maximum noise level of 95dB(A) in the Pressure Test room, we utilised an acoustic panel system which provided a 25dB reduction in noise levels - bringing noise levels in the Bench Test Rig/Chiller room and those in the local vicinity of the enclosure to circa 70dB(A), well below the First Exposure Action Level of the Control of Noise at Work Regulations 2005.